Pope Pius XI, Quas Primas: 1925, instituting the Feast of Christ the King. (tables are $25) or volunteering contact the rectory. There will also be a wreath sale on Sunday Dec. 2 after all the Masses. Our Music Ministry is organizing a choir to perform at the Midnight Mass. This is always one of the highlights of our Christmas season. All experience levels are welcome! Please come up to speak with Cantor Ulises Solano after Mass to sign up or email [email protected] . Advent: The Sunday Liturgies for Advent are beautiful in and of themselves and alterations are not appropriate. Should it be necessary for a family to have a Baptism during this time, another arrangement can be made. 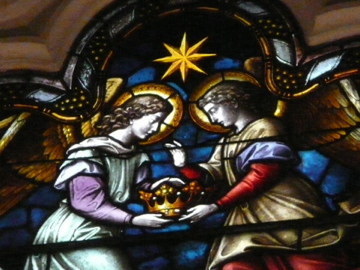 Christmastime: The appropriate Feast for Baptisms is the Epiphany, Sunday, Jan 6. We encourage people to schedule Baptisms at the 11:15 AM Mass on this day. Lent: As Lent is the time when the church prepares people for initiation into the Church, Baptisms are celebrated only in the case of an emergency during this period and not at a Sunday Mass. When I was a young priest, there were still older ones who spoke about “Representative Men”. It was an Edwardian expression for someone with superior skills who we would want to represent us. This is where we begin with the title: “Son of Man”. Although it is somewhat vague on purpose and will be developed by Jesus in a rather surprising way, we must remember that it has a specific place in the Book of Daniel. Our first reading last week was also from the book of Daniel and we saw that it was written about 165 BC in Jerusalem. The author wished to show that although pagan kingdoms were dominant for the short run, their power was subject to God – indeed the God of Israel. That reading was at the end of this discussion; today’s brings us back to the beginning. He virtually perfected evil. The next passage reveals how he killed off opposition in his own family and how he treated the world. We need to remember that we are speaking of a society radically unlike our own; They did not believe in the separation of Church and State, and a God was always going to be involved with the institution and the execution of government. There are many interpretations of the figure of the Son of Man and none of them fit into our categories. Indeed, the title may have always been intentionally ambiguous. Although some commenters believe the Son of Man is an angel it is more likely that he is a Representative Man, a person of great nobility who, knowing that his power and authority come from the Ancient of Days, will rule wisely. He may have been in some ways a sign of hope that a Jewish kingdom would follow Antiochus and that it would reflect a firm connection with God. This partially occurred with the Hasmonean Kingdom (142-63 BC) which followed the Maccabean rebellion. Yet only partially and as we have seen Daniel was very aware of the foibles of leaders and understood that the Justice of God will be fully seen only in the resurrection of the dead. There is a tension in Daniel between worldly and other worldly leadership that is both creative and perceptive. Not only were the Hasmoneans not effective or just rulers, but they were removed by the Romans who eventually installed the family of King Herod. But there are at least two things to learn from the original tension. As we have seen in our most recent election cycles, religious language can be used by many politicians without a real connection to God. Words are not enough nor are necessary political skills. We have the right – indeed the obligation – to ask for more. Democracy and the separation of Church and State are gifts to be cherished, but a lively connection with the living God is an even greater if rarer one. We need to search out, encourage and reward with public office those who we can find in our own community and those of other faith groups that bring this dimension.